I learnt an important lesson. Simply understanding the content was not sufficient. If I wanted to score high, I needed to memorize each and every point mentioned in the textbook and reproduce the text in my answer-sheet without spending time on thinking. I practiced just that for the next two months. As a result, I scored 98% in science in the board exams. A lot of policymakers/educators and people who “think they are educationists” label this learning approach as “rote-learning” and blame students and teachers. I would like to clarify that memorization is not necessarily rote-learning, but memorization without conceptual understanding is rote-learning. Nonetheless, the blame game is widely prevalent within policy circles and in the media and the broader context is ignored. 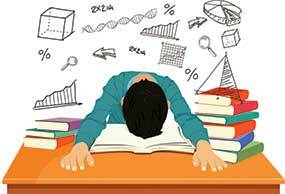 In this piece, I discuss the educational ecology that encourages memorization. With exceptions of some of the elite K-12 schools and premier higher education institutions (e.g., IITs, IIMs), educational assessment in general is based on the questions listed in the textbooks, previous exam papers (available to students) and/or practice-books at all levels (from primary to university-level). Even the state administered board examinations follow the same trend. Note that the 12th standard board exam result serves as a criterion (in most cases, a sole criterion) for the choice of career as well as admission to higher educational institutions. These exams focus excessively on knowledge and understanding levels of cognition (as per Bloom’s Taxonomy). The students rarely see test items that measure higher levels of cognition as well (i.e., application, analysis, synthesis, evaluation) and get an opportunity to exhibit their in-depth learning. Overall, the key to academic success is reproduction of “model” responses (or textbook responses) in a timely manner. Now, you see why students practice reproduction of model responses. Before discussing what teachers do, it is important to understand the context in which they function. For this, let us see the administrative setup. Educational policy is mainly a state-level issue. Undisputedly, India’s state administrative setup is highly centralized and extremely hierarchical. On a side note, the Chinese system is much more decentralized. The state administrators decide and allocate resources to all public schools. 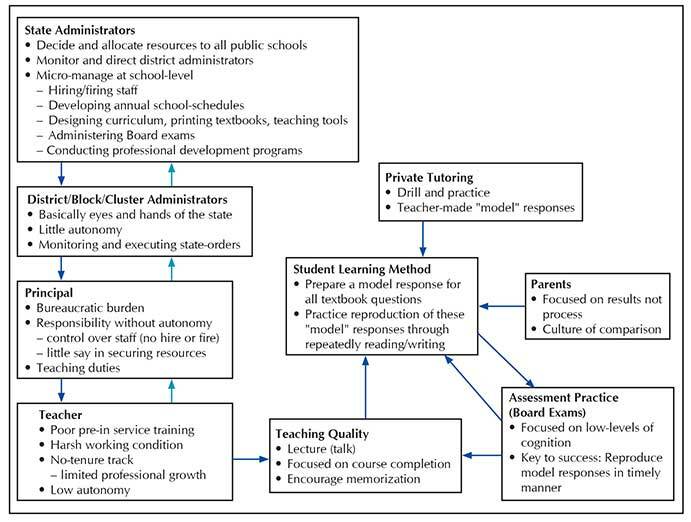 States micro-manage, for example: hire/fire school staff, develop annual-activity calendars for schools, design curriculum, print textbooks, teaching tools, administer board exams, and conduct professional development programmes. Of course, this is extremely burdensome for the state-level officers, but the system has been like this since Nehru’s time and there has been no public debate on decentralization and capacity building at lower administrative-levels. If you observe the functioning of these state-administrators, you get a feeling that India basically has only one school per state with classes spread across that entire state. Accordingly, the district/block/cluster level administrators function as eyes and hands of the state. They have very little autonomy, and are there to execute state orders and monitor all schools within their purview. The principal is basically a teacher with additional administrative duties like: taking responsibility of financial accounts and resource inventories, supervising teachers, keeping up with all state mandated year-round activities and submitting an incredible amount of paper work routinely, attending meetings whenever the higher authorities call (meetings may be called on the same day and one is expected to be present). But, s/he does not have much say in teacher recruitment, or acquiring funding or resources. Teachers may or may not face problems on a personal level, but this profession has been the biggest loser in India’s rapid educational-infrastructural expansion. Some of the big challenges include: extremely poor pre-service and in-service education, harsh working condition (close to 30-40 hours of lecturing per week with average class-size of 40), little access to teaching aids, and no time allocation for lesson planning, test development, or homework assessment. Average entry-level pay can be 10-15 times lesser for teachers than that for engineers. Note that there is no tenure-track and hardly any pipeline leading to professional growth. A teacher can at the most be a principal if luck favours (but that may not have any monetary benefit). No reward/recognition for good teaching, and pay increases are solely based on seniority. In this educational hierarchy, teachers are at the very bottom. Bossism is explicit and people at the higher level of administration display their power unapologetically. I have seen principals sit on the floor while the state administrators sit on a dais and receive an emperor-like treatment. It’s difficult to imagine a government school teacher arguing on a policy issue with the state-administrators. The entire social context is set up to make teachers feel they are subservient to all higher-level administers. Accordingly, instead of catering to the students, teachers cater to the principal and the administrators at the level above. In fact, the entire machinery caters to people at the level above and exercises power to shut down voices coming from below. In this tradition of catering to the bosses amid a demoralizing social context, teachers do what it takes to keep things going. The dutiful ones cover their syllabus. It should be noted that the Indian curricula across various educational boards cover an incredible breadth of subject content. To give an illustration, things that I studied in 8th grade physics (e.g., Newtonian Mechanics) are taught at the undergraduate-level in the US. The only way this great breadth of curriculum can be covered is through the use of lecture method. Ideally, a teacher will be able to spend some time introducing a concept and then demonstrate solutions for some textbook questions before moving on to new content. There is little time for experimentation or critical classroom discussions and to go in-depth into the subject. And let’s not forget, the exams do not care for depth. It is very common for teachers to ask students to write responses for the textbook questions more than once for homework. Parents in general are concerned about the results and not the process. Unfortunately, the social context is set up where memorization is considered as a sign of being genius. I have an untested hypothesis that children whose parents are more involved with their studies memorize more content. The prime purpose of private tutoring is to get access to model responses and to drill and practice more memorization. It is very common for tutors to share their own version of “model” responses with their students. What if we prepare a social context where students need to tap into their deeper levels of learning? This cannot happen overnight. It is a gradual process: more application level questions in exams, high quality teachers who are as professionally competent and as well-paid as any engineer, doctor, or scientist, more experimentation and higher order discussions in classrooms, entire administrative structure which caters to the students and not the bosses, and…. The author is an assistant professor at the Ravi J Matthai Centre for Educational Innovation at the Indian Institute of Management Ahmedabad (IIM-A). He can be reached at kathans@iima.ac.in.